thank you for visiting the official blog of newsbarbers - making the right cut. we are proud to present to you our splendid services, through this blog, which has the precise objectives of bringing back the ancient glory of barbershops as the repository of information, the center for exchange of gossip and opinions, the retailer of news and above all, the bringer of well-being and good looks. 1. The word "barber" was derived from the Latin word, "barba", which means beard. 2. Barbering dates back to antiquity. Barbers are mentioned in Egyptian, ancient Greece and Roman Folklore. Barbershops were favorite meeting place where everyone discussed the affairs of the day. 3. In folklore, the barber has been represented as a talkative person, the retailer of news, gossip, and homely advice. 4. The barbershop was a familiar institution in the ancient Greece and Rome and then, as now, was a center for the exchange of gossip and opinion. 5. Barbers flourished in large numbers inside monasteries and convents or religious houses where the monks or followers were required to be clean-shaven. They were familiar figures at the monasteries since 1002. 6. In early Christian monasteries, barbers rendered the important services of cutting and shaving the hair of the monks, who were required by ecclesiastical law to wear the tonsure. 7. The more prosperous citizens during the early times, particularly in Rome, had a barber as member of their house help and occupy a revered position in the household and therefore, became a status symbol. 8. The monastery barber was called "Rasor et Minutor" (barber and remover of blood). 9. The great houses of ancient Egypt also had barbers among their house help and offered free haircut as part of their hospitality to guests. 10. For six centuries, the barbers of Europe practiced surgery since most early physicians and university-trained doctors led by Arab physician Avicenna (980-1037) disdained surgery and considered bloodletting as beneath their dignity. Avicenna was the leading medical authority of medieval times. The custom began with the papal decree of 1163 that forbade the clergy to shed blood. They turned these duties over to the barbers. Surgery and other ministrations such as bloodletting, cupping and leeching, treating wounds, and extracting teeth. As barber-surgeons, they were accorded the address as "master" but the barbers preferred to be addressed as "mister." 11. Ambrose Pare, one of the great pioneers of surgery and regarded as the father of modern surgery, began his medical career as an itinerant barber-surgeon. 12. In France, a royal decree of 1383 declared that the King's first barber and valet was to be head of the barbers and surgeons guild that was organized as early as 1361. As members of the royal barber-surgeon guild, barbers were admitted to the faculty of the University of Paris in 1505. 13. The barbers of London were the first organized and recognized as a religious guild owing to their roots as monks' barbers but were granted a charter as a trade guild in 1462 by King Edward IV. 14. In 1743, King Louis XV prohibited barbers from practicing surgery and in England in 1745, the surgeons were separated from the barbers by acts passed during the reign of George II. Their final separation came in 1800 with the founding of the Royal College of Surgeons during the reign of King George III. 15. During their reign as barber-surgeons, barbers were sometimes called "doctors of the short robe" to distinguish them from university-trained physicians and surgeons whose superiority was only based on their knowledge to speak Latin and were given the title of â€œdoctors of the long robe. 16. The barbers trade was acquired only by a long apprenticeship until 1890s when schools for barbering were established. 17. In the United States, barbers are usually trained in special schools and must pass examinations and be licensed by the states in which they work. In the mid-1960s, there were 200,000 licensed barbers in the US, most of whom managed or were employed in small shops. 18. 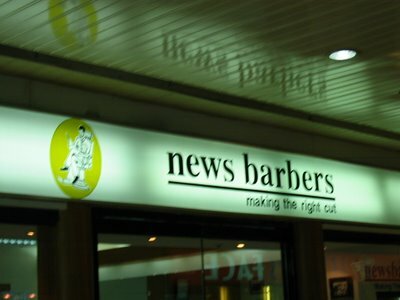 In 2003, an upstart barbershop put up by active and semi-active media practitioners, aptly called "Newsbarbers" opened in Quezon City, Philippines, with the precise objectives of bringing back the ancient glory of barbershops as the repository of information, the center of exchange of gossip and opinions, the retailer of news and above all, the bringer of well-being and good looks. Please check out all our pages (just scroll down) for more information about us. We also invite you to drop by our shops at: 1) Circle C Center, Congressional Avenue, Quezon City; 2) Ever Gotesco, Commonwealth Avenue, Quezon City; and 3) SM Fairview, Regalado Avenue, Quezon City or call +6324539037 or +6329527879 or +6324178960 for your inquiries.